I loved this so much. Loved the ending, so sweet and so wholesome. I love exploring the world through BMO. I love how this show forces you to take a series of ridiculous facts as givens, but if you trust the show, *it will not let you down*. It feels nice to have your trust rewarded like that. There is no beauty in the bathroom. Sometimes, when Adventure Time is really on, they manage to fit what feels like a full length movie into the span of 11 minutes. This time they managed to do an intense thriller dealing with identity issues. I loved this episode, but then again I am a total sucker for BMO, since they're my favorite character. But this was unexpectedly great even outside of that. The color palettes were deft - the way the bright orange of the traffic cone stood out as warm and real in the night, the glazed cold unreality of the mirror, the shifting passage of sunlight across the treehouse's kitchen. 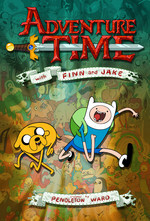 Adventure Time can sometimes be so whackadoodle that I have trouble suspending my disbelief a little, but the colors added that tinge of realness and place so I could let myself get absorbed in the story of this one. Jake's attempts to be an accepting friend were so cute to see - I love when the show drops little attainable role modeling moments in among the strangeness - and Finn being obtuse but genuine was so reflective of who he is at the core of his character. I loved the "family meeting" with Shelby the worm and Neptre making cameos; the way the cast has expanded consistently to make room for different types of stories being told but then incorporated into the world of show really makes me happy. The fact that the grapefruit were never explained, though. That was my favorite part.